Originally from New York City, Jody began playing guitar at the age of nine. She received musical instruction from a wide range of fine guitarists, including Paul Simon and Martin Simpson. At the age of fourteen she bought a Fender Telecaster and began playing in a high school rock band. They were terrible! 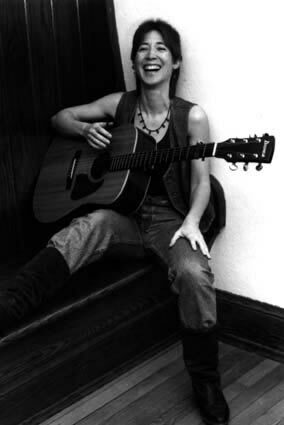 But being a fourteen-year-old female electric guitarist in the early seventies, Jody drew a big crowd. When the "turbulent teens" were over, Jody realized that her heart remained true to the beautiful resonance of her beloved acoustic guitar. In 1980, Jody traveled though Europe for many months with only a backpack and guitar. From the streets of Paris to the tunnels of the London Underground, and from spiritual communes to folk clubs, she wove a web of followers throughout the European continent. After returning to America, Jody played the folk circuit with Lorelei, a trio of women known for their stunning harmonies and gorgeous instrumentals. When Lorelei disbanded in the mid-eighties, Jody worked on her juggling act: perfecting balance between parenting, a "straight gig" as a classroom teacher, graduate school, music, martial arts, and spiritual practice. During this time, she also earned a reputation as a children's entertainer in the much-loved duo West of the Moon. When the juggling balls finally dropped, Jody came back full-circle to what she knew was her right livelihood and her deepest dream: sharing her gift of song. Jody is a seasoned performer who relates well to diverse audiences. Her fans tend to be progressively minded people of all faiths who appreciate music that speaks to our common heart, women who celebrate life by embracing the feminine spirit and creativity within, and anyone who appreciates great songwriting, crystalline vocals, and masterful guitar work. Whether it be a large concert hall, an intimate coffeehouse, or a festival stage, Jody has the ability to capture the hearts of her listeners. Knowing that music has the power to heal, inspire, enlighten, empower, and create community, Jody reaches down into our deepest places with her instrument and voice. Some songs may evoke tears, others lift the spirit, while others may inspire you to get up and dance to her acoustic guitar. "Kessler's impressive vocal, musical, and poetic talents express what she see through the eyes of love," says the Syracuse New Times.